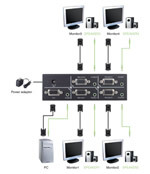 Commands 2, 4 and 8-port VGA Splitters with Audio allow you to display up to 8 VGA monitors and Stereo Speakers through one computer. 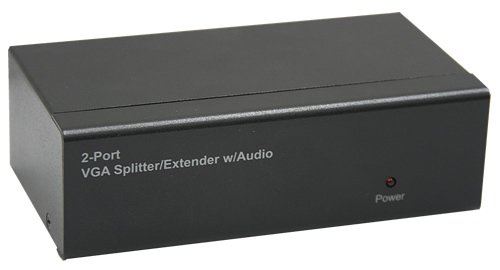 Ideal for use with Digital Signage Systems, AV installations, classrooms, multi-media centres, data centres, help desks and test bench faciliites, the VGA Splitter with Audio delivers both performance and value. The splitters can be daisy chained to provide support for additional displays. Duplicates and amplifies VGA signal and Audio line out to monitors from computers. Supports LCD, LED, Plasma, Projectors and CRT displays. Enhances video signals for long distance broadcast up to 60m. Supports display resolution up to 2048 x 1536. 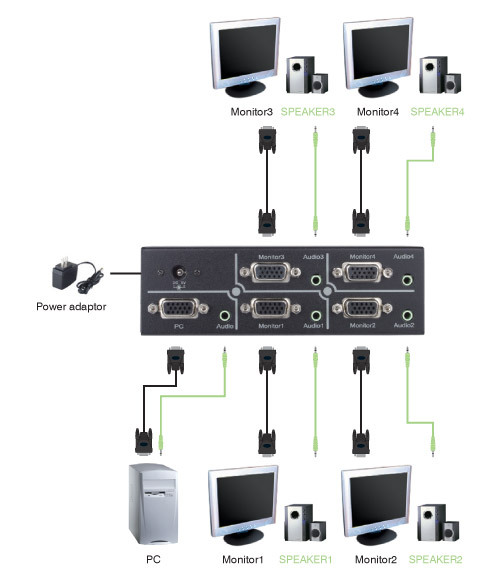 DDC/DDC2/DDC2B Plug & Play monitor support. Supports stereo audio op / 2-CH Audio, bandwidth: 30 KHZ. Cascadable via daisy chaining for additional displays. Connector Input: HD 15/F (Female) & 3.5mm Audio jack x 1 set. Connector Output: HD 15/F (Female) & 3.5mm Audio jack x 2/4/8 sets.